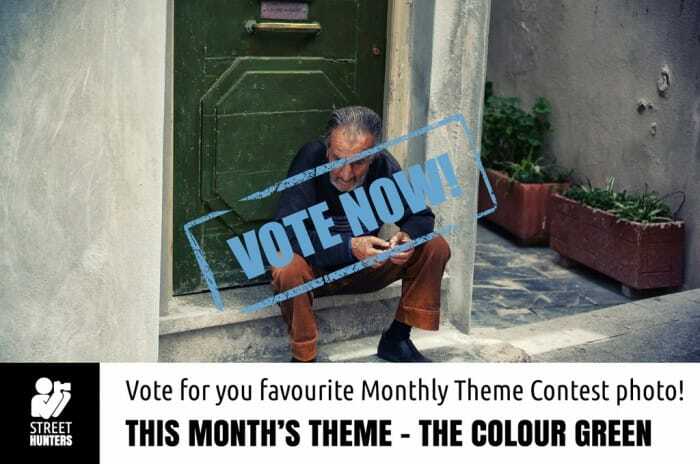 It is time for the Monthly Theme Contest for June 2014! The Monthly Theme Contest is a fun activity that anyone can participate in! Every month we choose a Theme. What we ask is for you our StreetHunters.net Readers to participate by each sending to us a Street Photograph at streethunters.net@gmail.com based on that Monthly Theme. So for example if the theme is Freeze time, then we would like you to each send a photo with a Freeze time moment. Your photo can be taken any time in history, we don’t mind, as long as it has been taken by you and nobody else. Once you send us your picture, we will decide which are the 5 or 6 or 10 best ones and we will post them on our website. May 2014 has come to an end and so has the Monthly Theme Contest! 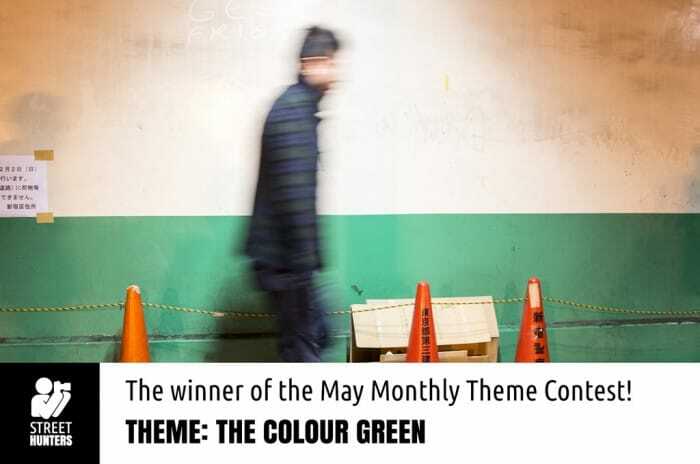 So it is time to announce the winner of the “The Colour Green” Theme Contest! 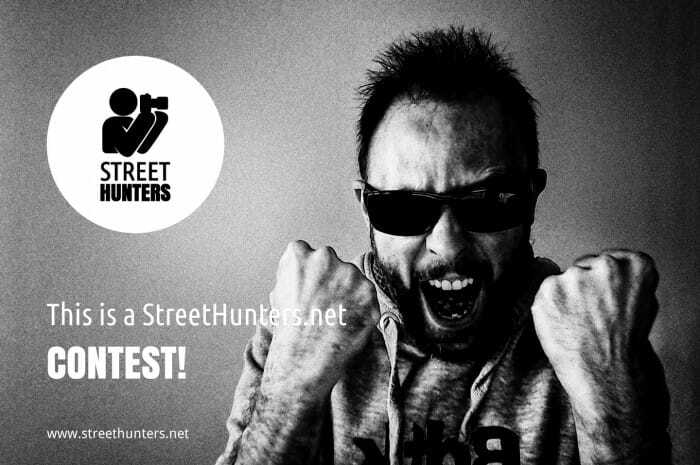 The winner will be featured in our 2015 StreetHunters.net Calendar and will also be used as the Street Hunters Cover photo in all our Social Media channels! The image will be replacing the current one within minutes of this posting, so check out our Facebook, GooglePlus and Twitter soon to see the winning photo there as well! Thank you all for submitting your wonderful work! All in all your photos received a total of 72 votes! Your participation both as voters and as contestants is highly appreciated! So, the time has come to please enjoy the photo of the Winner of the Monthly Theme Contest for May 2014! 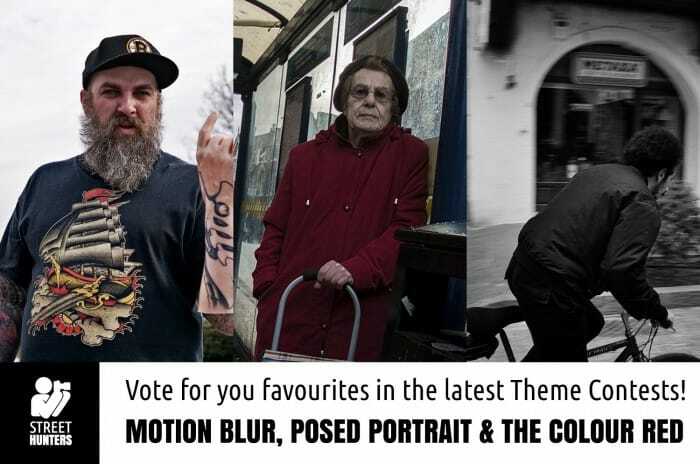 The time has come for you to vote for the best “The Colour Green” Street Photograph! We had loads of submissions once more! Exciting times! Andrew, Casper and myself had to decide which photos to add to the poll and which not. The decision was hard as it always is, but unfortunately only 10 can make it! All photos submitted are amazing! You will also notice that we haven’t got any names under the photos. The reason for that is to keep the voting as unbiased as possible. 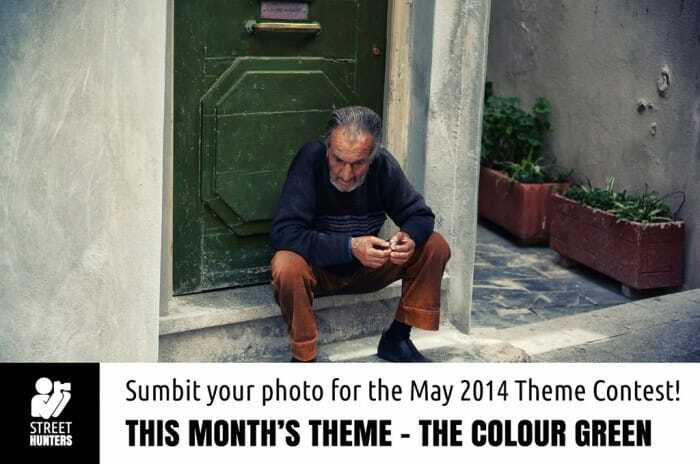 It is time for the Monthly Theme Contest for May 2014! So for example if the theme is Walk in the park, then we would like you to each send a photo with a Walk in the park. Your photo can be taken any time in history, we don’t mind, as long as it has been taken by you and nobody else. Once you send us your picture, we will decide which are the 5 or 6 or 10 best ones and we will post them on our website. 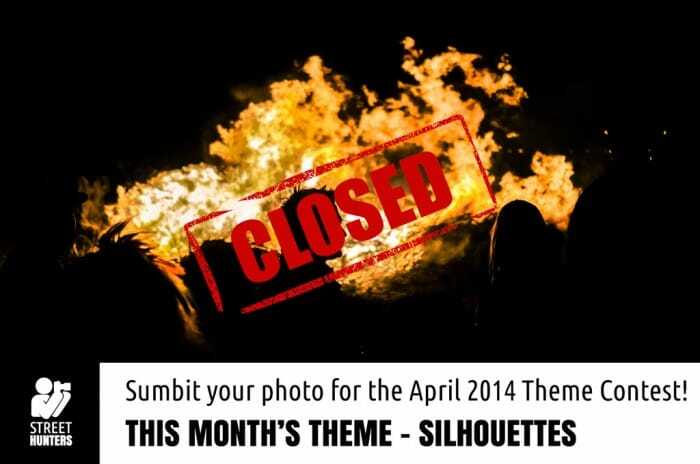 April 2014 has come to an end and so has the Monthly Theme Contest! So it is time to announce the winner of the “Silhouettes” Theme Contest! We got some fantastic entries from you all and the level of interaction in the polls was great! Your photos received a total of 60 votes! Thank you very much for your participation, it is highly appreciated! So, the time has come to please enjoy the photo of our winner! 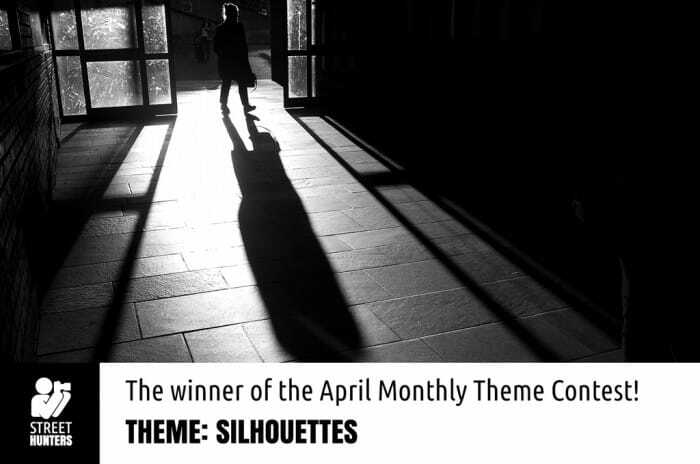 The time has come for you to vote for the best Street Photo for the “Silhouettes” Monthly Theme Contest! We had a ton of submissions this time around. Andrew, Casper and myself had to decide which photos to add to the poll and which not. The decision was hard! All photos submitted are amazing! Following the same method as last month, we have uploaded the images for each Theme into a lightbox gallery and under each image we have placed name that works as a unique identifier. So, what you have to do is to write down or remember the unique identifier of the image you like the most and then vote for that image in the poll below. It is time for the Monthly Theme Contest for April 2014! 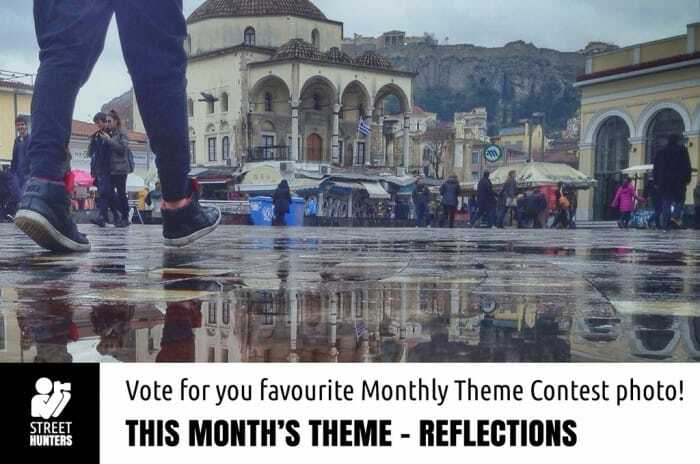 The Monthly Theme Contest is a fun activity that anyone can participate in! Every month we choose a Theme. What we ask is for you our StreetHunters.net Readers to participate by each sending to us a Street Photograph at streethunters.net@gmail.com based on that Monthly Theme. So for example if the theme is Umbrella in the rain, then we would like you to each send a photo with a Umbrella in the rain. Your photo can be taken any time in history, we don’t mind, as long as it has been taken by you and nobody else. Once you send us your picture, we will decide which are the 5 or 6 or 10 best ones and we will post them on our website. March 2014 has come to an end and so has the previous Monthly Theme Contest! As you remember in the original post about this new website monthly feature, we had mentioned that just for this time round we would be doing a 3 in 1 Theme Contest. So, today we have the great pleasure of announcing not 1 winner but 3! One winner for each corresponding month! We got some great entries from you all and the level of interaction in the polls was smashing! Your photos received a total of 137 votes! Thank you very much for your participation, it is highly appreciated! So, the time has come to please take a look at the winners of the Monthly Theme Contest that will be featured in our 2015 StreetHunters.net Calendar! Congratulations to all 3 of you Street Hunters! As you well know, this month we had 3 contests instead of one. The reason was for us to catch up and to get months January, February and March ready for our calendar. We are just trying to win the lost time (of not thinking about this sooner)! You can read more about these types of contests in our relevant blog post called “Announcing The Monthly Theme Contest!”. Announcing The Monthly Theme Contest! The Monthly Theme Contest is going to be a fun activity that anyone can participate in! Every month we will announce a Theme. 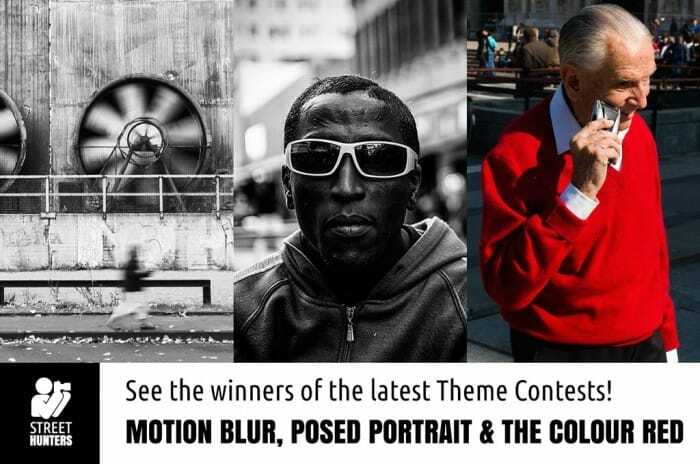 Based on this Theme we would like you, our Readers to email us each a Street Photograph at streethunters.net@gmail.com. So for example if the theme is Umbrella in the rain, then we would like you to each send a photo with a Umbrella in the rain. Your photo can be taken any time in history, we don’t mind, as long as it has been taken by you and nobody else. Once you send us your picture, we will decide which are the 10 best ones and we will post them on our website. Then, we will ask you to vote for the best photograph out of the 10. The best photograph will earn one spot in the annual StreetHunters.net 2015 calendar which we hope to print at the end of the year!